Yahoo, the weekend is here! I hope you have a chance to do something that brings you happiness and a few minutes for yourself. I'm a big-time crafter, so for me, I'm planning on altering some one-sies for my new granddaughter. Sewing. For me, its therapeutic and a chance to do something alone. That sounds pretty selfish. But, after working all week, its going to be nice to take an hour for me, and create! I also plan on going to the movies with my husband, to see the new Jason Bourne movie: Bourne Legacy. Ok, you most likely came here to see some paper crafting inspiration. 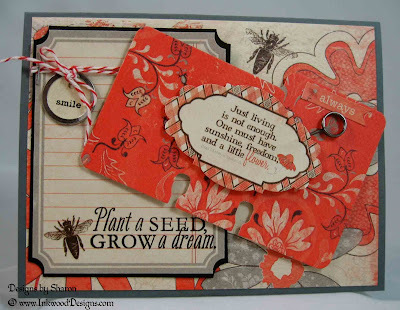 The creative Kim P. over @ Our Creative Corner, have a wonderful challenge for us this week. Kim, has a creative way of looking at things, and really gets us motivated to participate in her clever challenges. 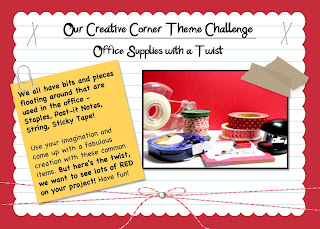 This week, Kim would like us to use office supplies on our paper craft item, but with a twist: use lots of RED. How unique! First, let me say, that I really had a fabulous time working with this challenge. It gave me the perfect opportunity to use this new pattern paper collection Carefree by Authentique. I just really love the colors in this paper collection: red, black, grey, brown, cream. So, I cut one pattern paper for the card front. I selected the large floral image, because I wanted an abstract pattern, so the card would look uniform and not distracting. I selected this other mostly red pattern paper to cut a Rol-a-dex file. I thought the shape was just so classic and fun. I added some various sticker pieces from the Carefree collection to my card. The 'always' banner piece is a sticker. Along with the 'Just living..' tag, and the large notebook paper piece. As for the Rol-a-dex card, I added a metal tag holder to give the card a rustic look. Now, the large notebook paper piece, I stamped the sentiment, 'Plant a seed, grow a dream' in basic black classic ink, next to the bumble bee. I wrapped some red striped bakers twine around the top of this sticker. Then tied a metal rim key tag. I stapled the bakers twine. I also stamped, 'smile' on the metal rim key tag. If you love red as much as I do, I strongly encourage you to play along with us this week. I know that you will have fun working with a favorite color and creating something beautiful! Please stop by Our Creative Corner to get some inspiration from our super talented design team, and share your paper craft item with us! You never know, you could be our next Top Talent! I can't stop scrolling back up to look at your card!! Each time I do, I see something I missed before. I love all the exquisite elements and the little messages here and there and the layout is superb! You've knocked this challenge out of the ballpark. LOVE it!! Your papers are beautiful, and the layers have been placed so very well, to give the on-looker time to appreciate all your elements, it is a wonderful card. Absolutely beautiful! Love the Rolodex card and the color!!! I love how you laid all of these elements out...perfect flow to keep the eyes moving! The string and the bees make me happy...busy as a bee at the office!!! Beautiful card Sharon! Love your layers and the way you put all the elements together.